August of 2018, Leah and I paddled 85km along the upper stretch of Northeastern Ontario's White River from Saniga Lake to the Bremner River. This is a ‘lost’ canoe route and we did our part to keep it open and enjoyable by brushing and signing most of the portages along the way as part of our ongoing ‘Lost Canoe Route Initiative’. Had a ton of camera issues on this trip, so didn't film as much I'd like. 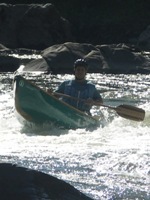 This is a doable trip at any water level, though late summer will require more lining and technical maneuvering of rapids while spring flows produce high volume rapids only suitable for the experienced whitewater canoeist. From Saniga to Pokei Lake the river is narrow and fast flowing. There are a few log jams, but most have been sawed with an opening just big enough for a canoe. One could easily make a there and back trip to Pokei Lake for a quick and easy getaway. We wish we had more time to venture down the lake as we heard it has some marvelous beach campsites. From Pokei Lake to the town of White River, the going is generally easy with the exception of a few rapids near the train tracks. These were massive boulder gardens with some 'surprise' ledges peppered throughout. The portages here are generally non-existent, but the railway makes for easy portaging around most sets. Line, wade or run the remainder, but always scout, as a few small waterfalls and obscured lines are present. After the town of White River, the route has clearly seen more maintenance however, it is still a rough and wild northern river route. Landings may be obscured and the trail overgrown in parts. It's possible to bypass the dozen or so rapids by portaging. We brushed and signed most of the trails, but it's recommended that future canoeists do their part by bringing saws to help keep the route open and viable. In the interest of time, there were a few short portages we skipped entirely and did not sign (with yellow portage markers) or clear. You'll have to brush them out if you want to skip the rapids. The ‘Pakoawaga Maze’ section is a nice change in scenery. The river meanders through sandy forests rebounding after the great White Lake Fire of 1999. File comment: The regenerating forest of the infamous 1999 wildfire. Looks like a nice trip! I've been waiting to see what the lower part looks like after the hydro developments are finished but every year they seem to push the opening further. Would the current heading from 17 to Pokei be annoyingly strong for a solo paddler to get back out that way? Current wouldn't be too bad if you went in July onwards. It'll definitely take you longer to head upstream but it shouldn't be prohibitive solo. There's one small rapid near Pokei Lake you'll have to line up. Other than that it's pretty easy going both ways. All the logjams had an opening to get by and we only had to lift-over once or twice. Thanks for discovering yet another lost canoe route. I had no idea that the upper White would have enough water in it to paddle during the summer. 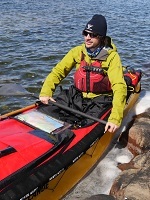 Most rivers draining into eastern Lake Superior are only runnable during spring snowmelt. This looks to be a better option than the lower White; especially now after the tragic death of Umbata falls. Sorry you had camera issues; I would have loved to see more video.